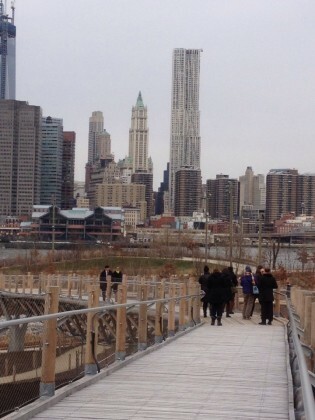 The opening of the Squibb Park Bridge, now updated with a new video by Karl Junkersfeld. Watch it after the jump. Mr. J. and his cam were busy this past week. In addition to his visit to Julianna’s, Karl attended the grand opening of Brooklyn Bridge Park’s Pier 5 Thursday morning. In his video, Karl begins with a retrospective of some of his favorite BBP events from the past few years. 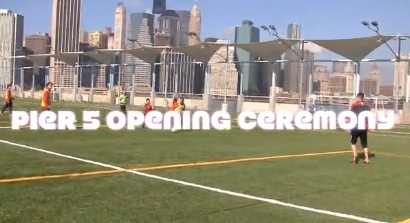 He then shows the dignitaries gathering, Mayor Bloomberg’s speech, and the pier’s athletic field in use. Our man Karl weighs in on the 60 cent cheesecake giveaway, celebrating Junior’s 60th birthday. Watch the clip and stop on by—hopefully the line will only be a block long! BHB’s Karl Junkersfeld takes us through the history of Montague Street…Part 1. Mr. Junkersfeld’s Neighborhood – Get Out and Eat! Brooklyn Heights’ answer to Bob Lape, Karl Junkersfeld hits the road with his documentary film crew (aka his feet) and provides us with a fantastic primer on great restaurants in Brooklyn Heights and beyond. Brooklyn Heights own version of D.A. Pennebaker, Karl Junkersfeld is back with more of his unique kind of video vérité. In this first clip he celebrates NYC Restaurant Week. After the jump his epic three part tour of Fort Greene, a must-see for anyone who dreams to venture beyond the boundaries of Brooklyn Heights.